Need to get away before Christmas? The spectacular attractions at Disney and the many other theme parks can be enjoyed without having to endure the long lines and stifling heat of Orlando's summer months. Join Perkiomen and take advantage of this winter getaway! Visiting Orlando in the off-season can save you time and money. 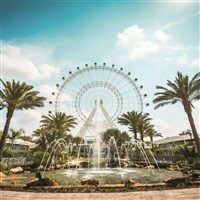 Whether it's a white-knuckled thrill ride, exciting round of golf, mega shopping junket or a moving theatre performance, Orlando and the surrounding Central Florida region is a perennial favorite destination among vacationers. Need to get away in the winter? Escape Pennsylvania and travel with Perkiomen to the Sunshine State of Florida for a six night stay at the Rosen Inn on the world famous International Drive. This evening our lodging will be in Fayetteville, NC. After a continental breakfast, we will continue to Orlando, arriving in the early evening. You are free to do as much or as little as you would like for the next six days. The Rosen Inn has a restaurant, cafe, lounge, outdoor heated pools, gift shop, arcade and business center. It features tropically decorated and spacious rooms with two double beds. All rooms are considered "semi suites" featuring mini refrigerator, microwave and coffee maker. Free transportation to Universal Studios and Sea World is provided. A guest service desk is available to help with admission tickets and transportation needs. The I-ride Trolley, shopping and restaurants are all within walking distance. Spend five full days in Orlando to enjoy at your leisure. You will have access to Disney's four major theme parks. Transportation to Disney is an additional expense and park admissions are not included. The Magic Kingdom features timeless attractions, such as the Hall of Presidents, EPCOT, which consists of Future World and the World Showcase, not only features educational and fun rides, but world-class restaurants right within the park. Experience the magic of movies at Hollywood Studios and be sure to visit Disney's Animal Kingdom, one of the largest animal theme parks in the world. Universal Studios Theme Park and Islands of Adventure are also in Orlando. These two parks can be explored in a single day during the off-season when there are shorter lines. Try your hand at wizardry at the Wizarding World of Harry Potter with Harry Potter themed attractions at both parks. The parks offer ticket specials that allow visitors to enter both parks in a single day, so be sure to inquire about such a package. At Sea World you can see whales, dolphins, Belugas, manatees and penguins. Ride the rides, catch a show and learn about the animal rescue efforts. Theme parks not your thing? There is still fun to be had in Orlando. Shop, browse and dine at Disney Springs. There is a movie theater, specialty shops and many dining experiences like the House of Blues, Wolfgang Puck, Planet Hollywood, T-Rex & the Rainforest Cafe. Universal's CityWalk offers a variety of shops and boutiques where you can pick up a souvenir for yourself or the folks back home. Themed restaurant options allow you to listen to music and dine on specialty items at NASCAR Sports Grill, NBA City, Jimmy Buffet's Margaritaville, Emeril's and Bubba Gump's. With all of the restaurant options you will never run out of places to eat. During the day play, miniature golf at one of Orlando's amusing courses or hit the links at one of the many outstanding public courses in the area...sand traps are not as bad when they are shaped like Mickey Mouse! This morning we must check-out and depart for home. Retracing our route, with an overnight in Fayetteville, NC, we will arrive home in the early evening on Sunday.